I’m smart! Why is this so hard? School has always been easy. I’d go to class, sort of pay attention, and quickly finish my assignments. I never really studied because I didn’t have to. I’d feel guilty sometimes because I never had to try very hard to do well. Teachers/professors love my work! At first, I thought the “C-” on the exam was a fluke. “Okay, maybe I need to study for this class,” I told myself. I made a few careless mistakes and didn’t do the reading assignments. So, I changed my approach. I read everything that was assigned, I made a study guide, and even joined a study group. I was teaching everyone else the material! How did I get a “D”? What am I missing? Many people who do well in school don’t create sound study habits. They rely on their intelligence to get by without giving it a lot of thought. Until they find themselves with someone like Professor X. It may be that they started studying a new subject or maybe the assignments and format of the class are unfamiliar. Regardless, they find themselves struggling! 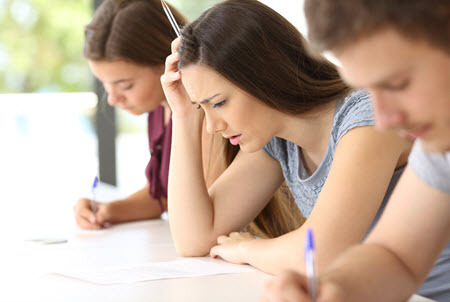 Poor grades can lead to an identity crisis. With each academic step forward, we find ourselves narrowing the ocean to a lake, lake to a pond, and pond to a puddle. We might even go puddle jumping. Either way, we are surrounded by people just like us – and sometimes better than us. New demands on our abilities can be overwhelming and can make us question if something is wrong. For some of us, we’ve gone through life without ever knowing that our learning is inefficient and potentially indicative of a disability. For others, academic pitfalls are related to poor study skills and time management, which can lead to intense anxiety. We end up battling our own mental health and disappointing ourselves with not meeting our challenges. Assessment identifies the root of your academic troubles and highlights the learning differences that may no longer be working for you. Therapy can help you wade through the anxiety and disappointment to find a new equilibrium. You are still smart and can succeed! Let us help you find your way back. Schedule an Appointment for Assessment or Therapy. Contact us at (323) 345-1402 today.